At Christmas 1914, in the trenches along Belgium’s Western Front of WWI, something remarkable happened – remarkable enough that 100 years later it’s still being written about. 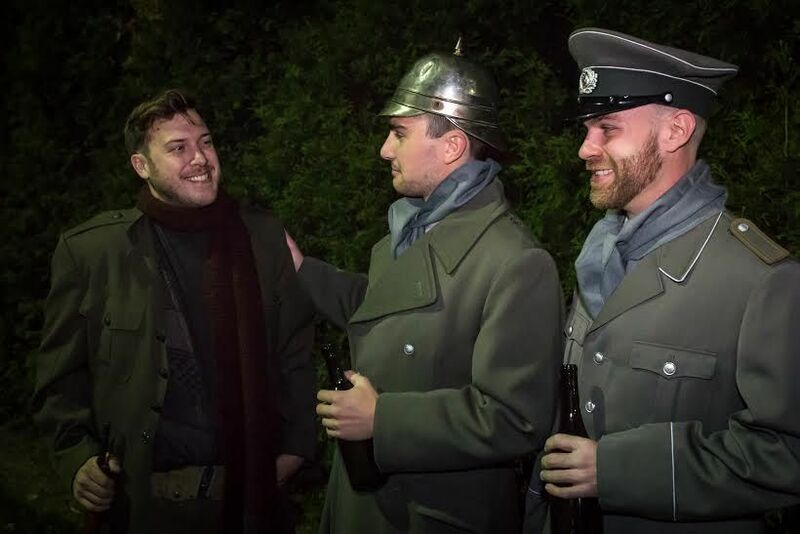 Just five months into what would become a long, blood-drenched war, when armies still had hope of going home, a spontaneous Christmas Truce took place in several spots in the No Man’s Land between the battle lines. Soldier’s Christmas, by Fort Thomas playwright Philip Paradis, has its world premiere December 12 - 21 at Northern Kentucky University, produced by Actors & Playwrights Collaborative and with an assist from New Edgecliff Theatre. Paradis was inspired to put the story on stage more than a decade ago, when he was listening to an NPR interview with author Stanley Weintraub, who’d just published Silent Night about the truce. He’s created two fictional characters, a British corporal and a German sergeant, for his play with songs. They both risk their lives to scavenge a farmer’s cart abandoned between trenches and surprise each other. They set aside their rifles, at least for a brief moment in time, to talk about their lives and their world. Soldier’s Christmas has been ten years in the making, with changing characters and tone. He knew he wanted “drama, humor, good will", he just needed to find the right balance. Paradis is one of Greater Cincinnati’s most prolific playwrights. While Soldier’s Christmas was evolving through almost six staged readings (it began as a one-act at Cincinnati Playwrights Initiative) he was writing other plays: three full-length plays, 10-minute plays, more than two dozen one-acts, some of which have been produced at Cincinnati Fringe, the Anderson Center and Village Players of Fort Thomas. Through all the readings and re-writing, the positive reinforcement from audiences “has kept me working on it.” Positive response has come from play competitions, too. Soldier’s Christmas was a finalist in the Kentucky Theatre Association Roots of the Bluegrass New Play Contest in 2011. He’s also recipient of the 2014 Kentucky New Play Series Award for Sunny Side. Last year, New Edgecliff’s Jim Stump suggested a production of Soldier’s Christmas would be a perfect fit for 2014’s “Cincinnati Remembers World War I” centenary celebration. If Actors & Playwrights Collaborative doesn’t ring a bell as producer, it’s a group Paradis pulled together a few years ago, with a fluid membership. “I call it the ‘Super-ecret Saturday Morning Club,’” Paradis jokes. Soldier’s Christmas, Dec. 12-21, Corbett Theatre, Fine Arts Center, Northern Kentucky University, Highland Heights. 8 p.m. Friday and Saturday, 3 p.m. Sunday. Advance tickets: $22 adults, $20 seniors and $18 students. At the door: $25 adults, $23 seniors and $21 students. *There is a fee applied. 1-888-428-7311 and www.Cincyticket.com. For more information about the play visit www.soldierschristmas.net.